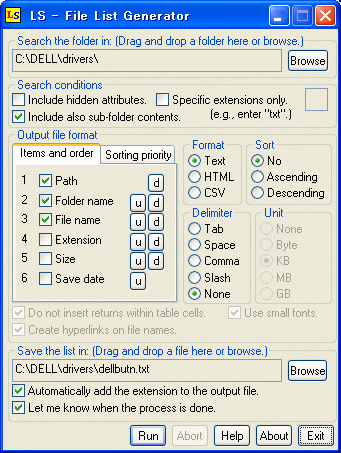 LS - File List Generator collects information about all files and subfolders located under your specified path and generates a listing in various file formats, including text, HTML and CSV. How to extract: Download the ZIP package and extract to a folder of your choice. Launch LS.exe. I do not have access to Win7 to test this but you might try deleting LS.exe.manifest located in the program folder. Its only purpose is to change the GUI to match the XP Luna theme. I found that deleting it greatly improved stability on XP. If you try it please post back with results. May work well for 9X and XP, but crashes on Win 7. The software is out of this world, very easy to use, saved me hours of work!! I love it and have been using it for years. testing installs and it makes my testing and sorting much easier. I've tried it, the program does its job good but crashes constantly while I try to close it (Windows XP SP2). Don't know if its my systems glitch or programs, but I'm gonna try some other similar tools. I highly recommend this software. I have to use it at the end of every quarter to create a list of the documents I've done.